Story: When the kingdom's most wanted - and most charming - bandit Flynn Rider (voice of Zachary Levi) hides out in a mysterious tower, he's taken hostage by Rapunzel (voice of Mandy Moore), a beautiful and feisty tower-bound teen with 70 feet of magical, golden hair. Flynn's curious captor, who's looking for her ticket out of the tower where she's been locked away for years, strikes a deal with the handsome thief and the unlikely duo sets off on an action-packed escapade, complete with a super-cop horse, an over-protective chameleon and a gruff gang of pub thugs. 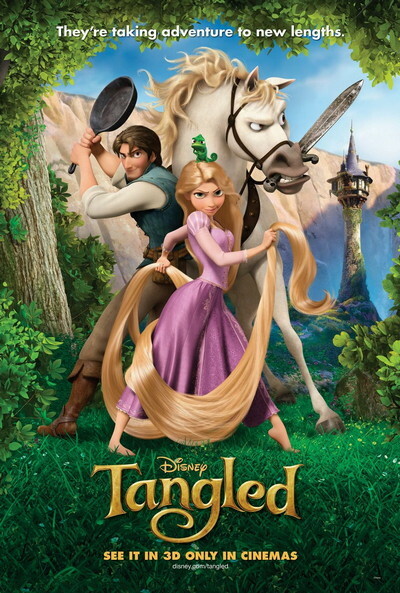 Tangled is a story of adventure, heart, humor and hair - lots of hair.